When you paste a picture into a note, is there any way to format it like you can do in Microsoft Word? For example, "wrap" the image? Hi. Apart from the blue frame around an image, which you can use to increase or reduce the size, and the use of tables to 'arrange' images and text next to each other (and also control the size), there's no layout formatting (yet) in the Windows Client. More options may be on the way in the future, but what you see is currently all you're getting. 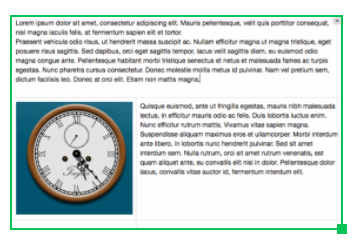 It's of course possible to do a more complex layout in Word, and print that to PDF and attach that file to a note to display a formatted page inline. Word files don't show up that way (again yet) in Windows, though I believe they do in the Mac client. If I attach a PDF layout to a note I'll usually also add the Word document to the end of the note so I can edit it when necessary. Word files don't show up that way (again yet) in Windows, though I believe they do in the Mac client. On a Mac word documents have an inline display option, similar to PDFs. A high % of my notes include word documents. As you posted, a Table is the easiest method to insert a layout into a note. I like the way it controls the image size, and text can be wrapped around a picture. Thanks / somehow this slipped my mind / don't know what I was thinking of where I thought I couldn't.